The non-marine, trace fossils in New Mexico are the subject of this publication. Ichnology of an Early Permian Intertidal Flat: The Robledo Mountain Formation of Southern New Mexico describes and illustrates both the invertebrate and vertebrate trace fossils found in an upper intertidal flat setting. Eighteen invertebrate ichnogenera are described. Previously described vertebrate ichnogenera and ichnospecies are reviewed, along with a description of a new ichnospecies. 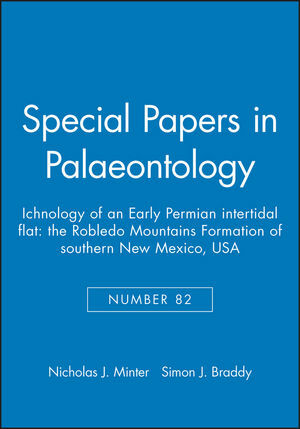 Nicholas J. Minter and Simon J. Braddy are the authors of Special Papers in Palaeontology, Number 82, Ichnology of an Early Permian Intertidal Flat: The Robledo Mountains Formation of southern New Mexico, USA, published by Wiley.